If you have been to San Francisco’s Fisherman’s Wharf anytime in the past 30 years or so you probably came across the World Famous Bushman. The Bushman (his real name is David Johnson) has scared tourists on the Wharf since 1980. He hides behind a clump of eucalyptus branches and when unsuspecting tourists walk by he shakes the branches and growls in his deep, gravelly voice causing his quarry to jump, squeal, scream, and otherwise go a bit apesh*t. Of course this is to the enormous delight of all those who are in the know and watch from afar. Sure it’s a bit juvenile, but it is very funny to watch and compared to some of the other street entertainment at the wharf, it’s good fun. So, Kongo found the Bushman taking a break, introduced himself, and talked the Bushman into having his picture taken. 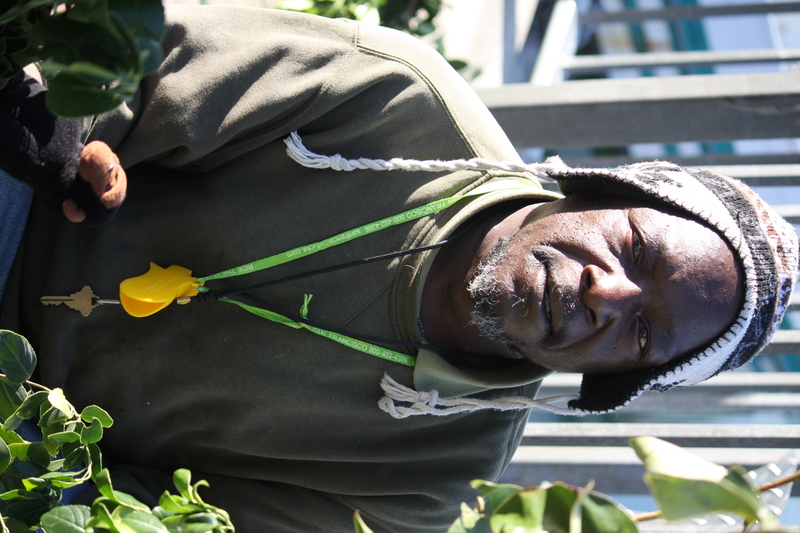 The next time you’re on the Wharf, be sure to keep an eye out for The World Famous Bushman.